This White Beans recipe is so simple, yet so delicious! Cannellini beans cooked with tomatoes, garlic, and chicken broth make for one tasty side dish. It’s perfect for holidays or easy weeknight meals! 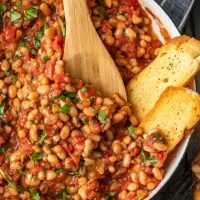 This white beans recipe with tomatoes and garlic is such a great side dish for just about any occasion. It works for big holiday feasts, nice dinners at home, or just for a quick add on to weeknight meals. I love the simplicity of this recipe. It’s super easy to make and yet it tastes amazing. This veggie dish is the perfect thing to add to the table on Thanksgiving or Easter because the flavors blend so well with everything else. It tastes so good with turkey or ham! I’d actually really like this as a simple appetizer too. Throw in some nice crusty bread for dipping and you’ve really got in made. 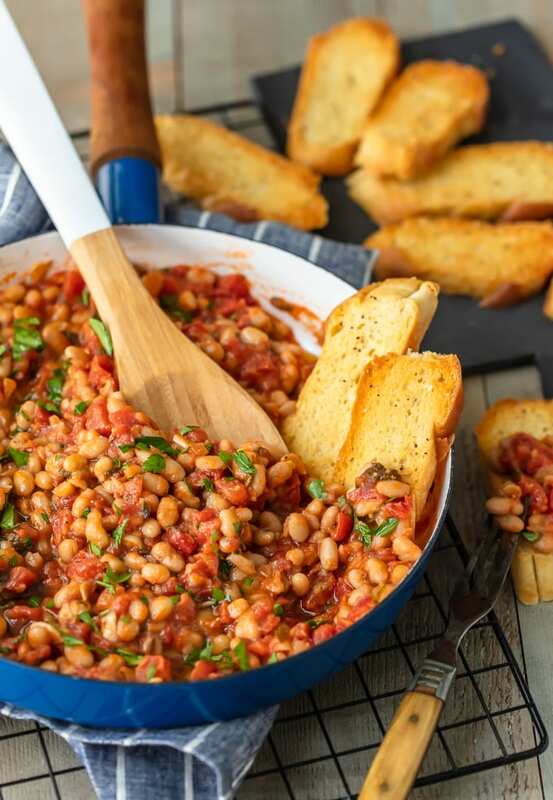 This White Beans with Tomatoes and Garlic recipe makes the perfect side dish for all occasions! I could always use more easy side dishes to add to the rotation, especially around the holidays. Something simple, but incredibly delicious. 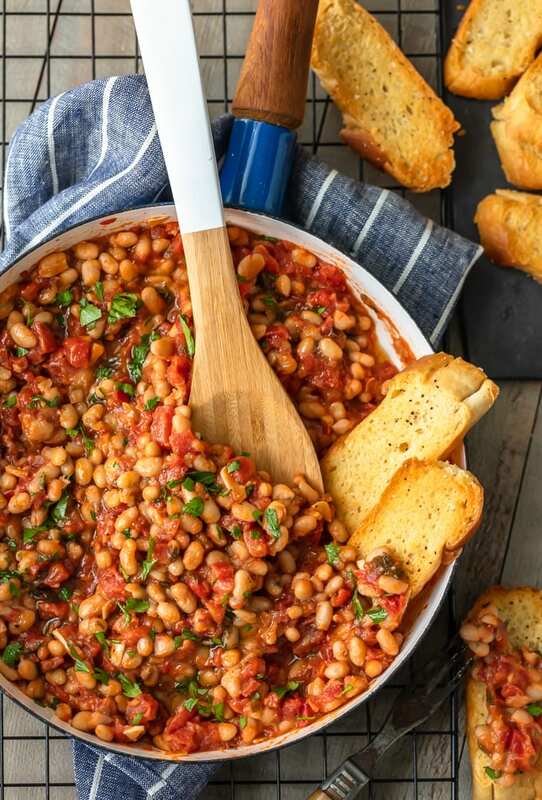 This white bean recipe is exactly that! It only takes about 20-30 minutes to make, but it’s filled with flavor. 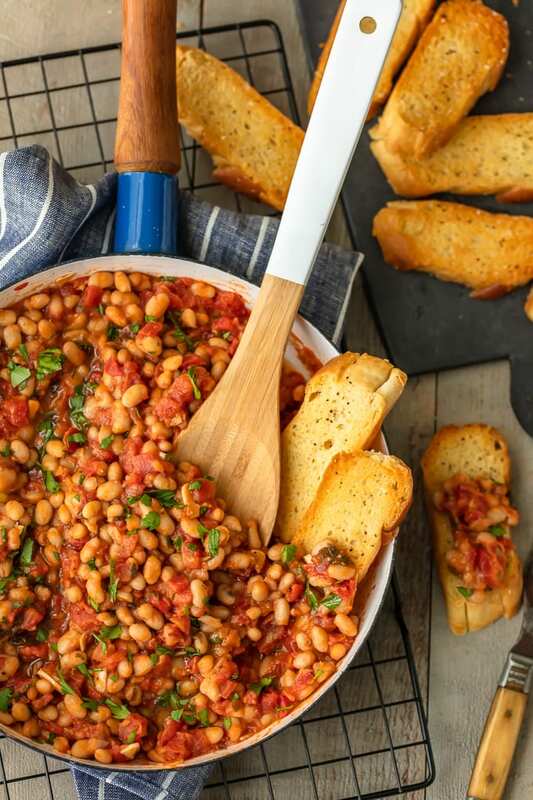 The mix of beans, tomatoes, garlic, and more just tastes so good! Are white beans and cannellini beans the same thing? Cannellini beans are a type of white bean. Navy Beans and Great Northern Beans are also included in the white bean category. This might be one of the easiest side dishes you make all year! All you really have to do is throw everything into a skillet and let it all cook together. Start by heating up some olive oil in the skillet, then add in the sage and garlic and gently shake it up a bit (don’t stir). Reduce heat and cook about 3-4 minutes. Add in the diced tomatoes and salt. Let it simmer for about 8-10 minutes, stirring occasionally. Add in chicken broth, sugar, and pepper, and cook until the broth starts to boil. Reduce heat to low. Add in the beans and let it simmer 18-20 minutes (until liquid evaporates). Removed from heat and stir in the parsley. Serve it while hot, top it with bacon bits if you want, and drizzle some more olive oil over the top. 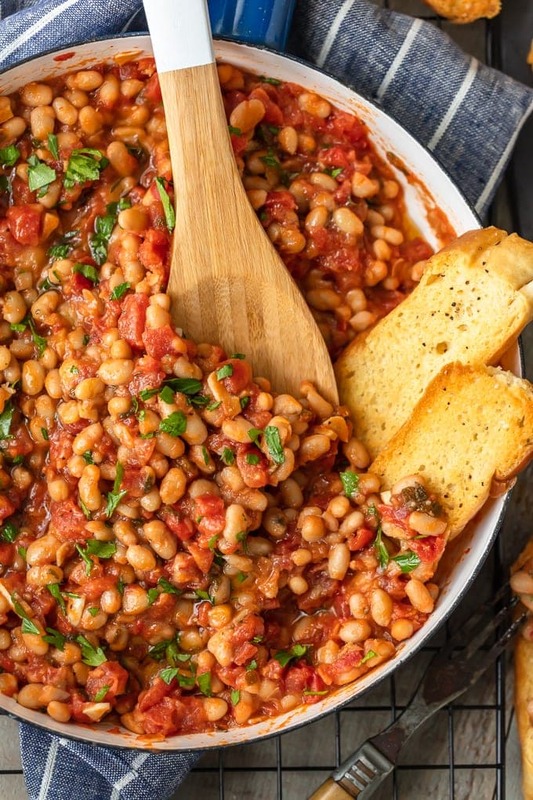 White Beans with Tomatoes and Garlic is the perfect savory side dish. It goes with everything and tastes amazing. You’re going to love it! 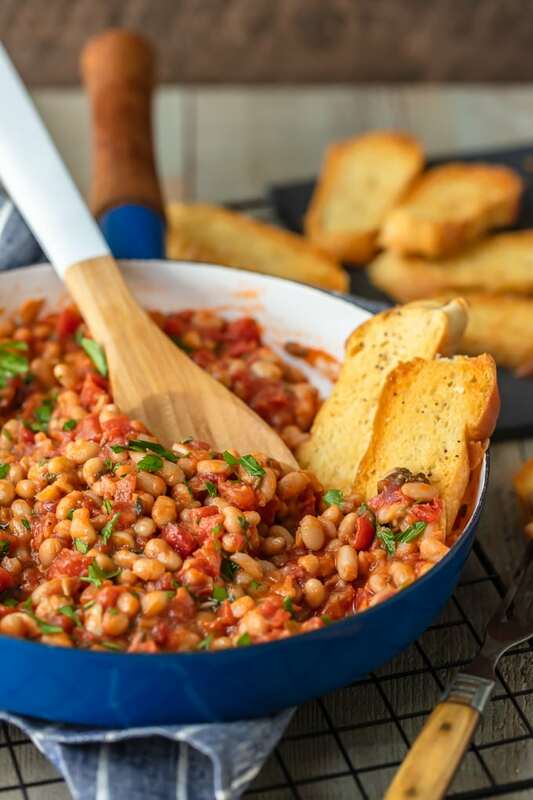 See the recipe card below for details on how to make White Beans with Tomatoes and Garlic. Enjoy! 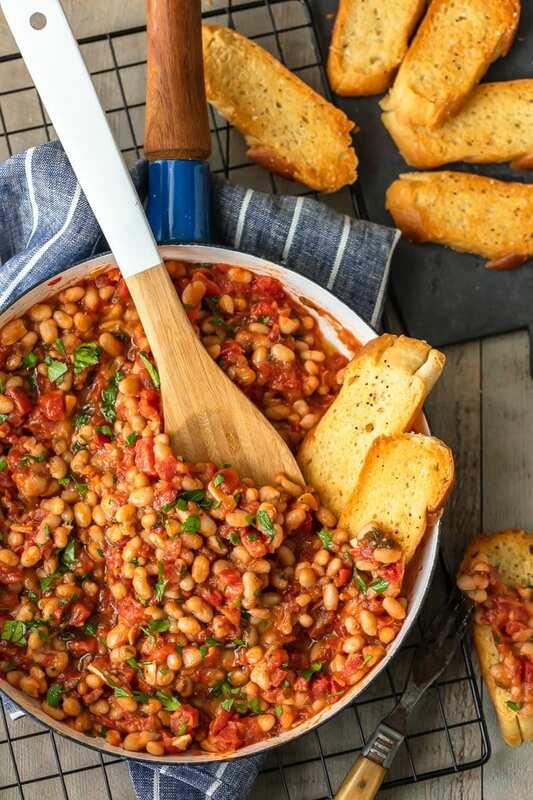 This White Beans recipe is so simple, yet so delicious! Cannellini beans cooked with tomatoes, garlic, and chicken broth make for one tasty side dish. 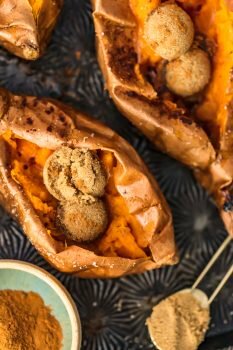 It's perfect for holidays or easy weeknight meals! Add the sage and sliced garlic. Shake the pan so the garlic doesn’t stick, but don’t stir it because the garlic might clump. Reduce the heat to medium-low and cook 3-4 minutes or until the garlic turns very light gold and the sage darkens a bit. Add the tomatoes and salt. Simmer, stirring often, until the tomatoes are shiny and their juices have evaporated; 8-10 minutes. Add the pepper, sugar and chicken broth, stirring often, and bring the broth to a boil. Reduce heat to low, add the beans, simmer (stirring often) until the liquid has evaporated, 18-20 minutes. Remove the beans/tomatoes from the heat and stir in the parsley. Season, if needed, with more salt & pepper. 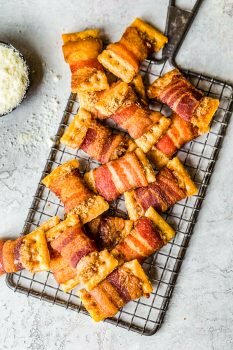 Serve with extra olive oil for drizzling and a sprinkle of crispy bacon (optional).